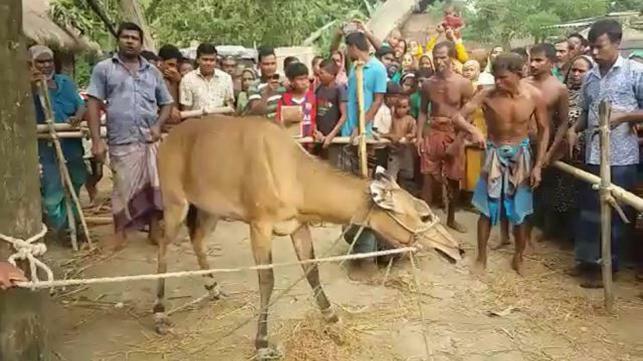 Bangladesh’s only female Nilgai which was rescued from Ranisankail upazila of Thakurgaon district last year died at Ramsagar National Park in Dinajpur on Saturday evening. Abdus Salam Tuhin, a caretaker of the national park, said two endangered Nilgais – a female and a male -- were roaming inside the mini zoo of the park on Saturday. Suddenly, the female one fell down after being dashed with a bar of the fence and died on the spot. Meanwhile, a three-member probe body was formed to unearth the reason behind the death of the endangered animal, he said. Nilgai is a species of deer, usually large brown or bluish grey, native to Bangladesh, India, Pakistan and Nepal. Nilgai was declared extinct in Bangladesh by the International Union for Conservation of Nature.